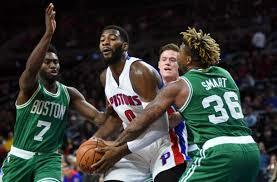 Hoping to start the post All-Star game portion of the schedule on the right foot, the Boston Celtics and Detroit Pistons face off on Friday night in the Motor City. It will be the first game back for both teams since Sunday’s new format All-Star game between Team Lebron and Team Steph. Lebron’s team came out on top with a surprising defensive stop on the last possession and Lebron was awarded his 3rd All-Star game MVP award. Even though this is the first game back for the Celtics and Pistons, it’s actually an important one. Boston dropped three straight games and three of their last four prior to the break. Detroit also comes in on a downswing having lost three of their last four also. The Celtics lost the top spot in the Eastern Conference to the Toronto Raptors and are now two games behind and in the second position. And the new look Cleveland Cavaliers are looking to gain ground in the third position but are still four and a half games back of Boston. The Pistons, who made the biggest trading deadline acquisition when they acquired forward Blake Griffin from the Los Angeles Clippers, need a surge in their final 25 games just to get into the playoffs. Currently, Detroit sits one and a half games behind the Miami Heat for the 8th and final spot in the East. But since getting Griffin, Detroit has been up and down. After the trade, they won five straight games (four with Griffin), and then lost four games in a row before a tight win over Atlanta in the final game before the break. With little time to practice, it’s been tough for Pistons Head Coach Stan Van Gundy to integrate Blake into the offense. And for Griffin, he’s been content to try and set up some of his new teammates than be overly aggressive on the offensive end. Expect him to become a bit more the focal point of the Detroit offense in the last two months of the season if the Pistons expect to make a run. Andre Drummond has been playing at a high level for Detroit and it doesn’t appear to be a problem playing alongside Griffin. But they’ll need more consistent performances from the other players around them to gain a playoff spot. Those include Stanley Johnson, Reggie Bullock and a player returning soon from injury in guard Reggie Jackson. For Boston, Head Coach Brad Stevens needs to get some players back healthy to get things rolling again. We all know they lost their new star forward Gordon Hayward in the team’s first game, but recently have had a group of other injuries. Forward Marcus Morris has been in and out of the lineup but has been productive when he plays. Others who have appeared on the injury list have included Jaylen Brown (ankle), Shane Larkin (knee), Al Horford (head) and even Kyrie Irving (quad). But this is a well coached team that plays good defense, and even with a short-handed lineup, the Celtics should be in any game they play. And now that they’ve had a chance for most of the team to get some time off during the break they should be at close to full strength for the matchup against Detroit. Things don’t look easy for Van Gundy with 15 road games of their 25 remaining games, which is why this home game against the Celtics is a big one for them. A win could get them on a roll and add some confidence to the new look Pistons. They also, however, have a big six-game West Coast trip to look forward to beginning on March 13th in Utah and ending on March 22nd against James Harden, Chris Paul and the Houston Rockets. Boston has just 23 games left on their schedule with 14 of those on the road. They would certainly like to get off to a good start a win over the Pistons and another against the depleted New York Knicks the following night in New York. Another couple of games they are looking forward to are a March 3rd game against the Rockets and a March 31st game against the Raptors.